The business houses and people along the street of Labasa Town were taken by surprise, when the Republic of Fiji Military Forces (RFMF) Band marched to Subrail Park during midday yesterday. 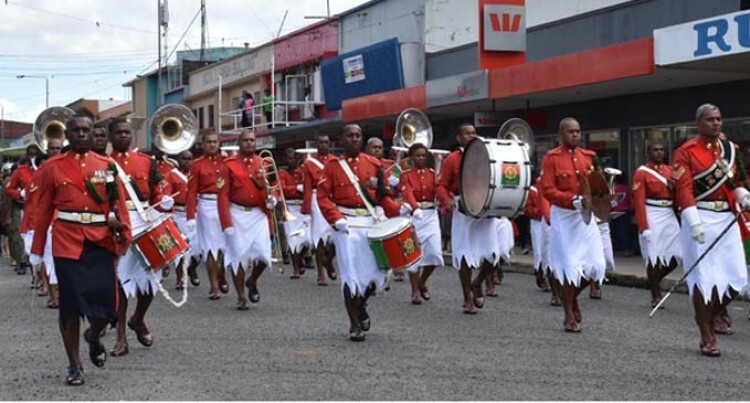 The march accompanied by RFMF officers and representatives from Government departments took to the street to mark RFMF band’s 100th year anniversary this year. Chief Guest, Divisional Secretary Northern, Soko Tuima, while speaking on behalf of Commissioner Northern Jovesa Vocea at Subrail Park yesterday, said the people of the friendly north should be grateful that Labasa was the first town chosen to launch this centennial celebration. “The band started from a humble beginning in 1917 and overtime it became a household name in the domestic and international arena,” Mr Tuima said. “Over the years they have built and earned a legacy and a reputation that has stretched far beyond our shores. “While the band will provide entertainment at the park today (Tuesday), Government departments will showcase their services and corporate organisations will sell their products,” Mr Tuima said. “This is an opportunity for the public to be served with all the services provided to them as a one stop shop. A similar celebration will take place in the central and western division. Today (Tuesday) the band will carry out community service work at the Labasa School for Special Education and the Labasa Senior Citizens Home.